Product information "Anti-Progranulin (human), clone PG359-7"
Recognizes human progranulin. Detects a band of about 90kDa by Western blot. Liquid. 0.2µm-filtered solution in PBS, pH 7.4. Contains no preservatives. Progranulin (PGRN) is a widely expressed pluripotent growth factor which plays a role in processes such as development, wound repair and inflammation by activating signaling cascades that control cell cycle progression and cell motility. Its function in the central nervous system is of interest, as mutations in the PGRN gene were found in cases of frontotemporal degeneration (FTLD). In addition, PGRN has also been linked to tumorigenesis. 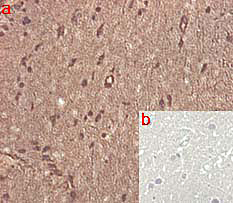 Progranulin is a biomarker for FTLD, other types of Alzheimer's Disease (AD) and potentially for MCI (Mild Cognitive Impairment). Additionally, PGRN is described as a new ligand of TNF receptors and a potential therapeutic against inflammatory disease like arthritis. Customer review for "Anti-Progranulin (human), clone PG359-7"